When you are pressed for time, and don’t think you can workout then think again. It isn’t about how much time you need but what you do within that time that truly counts. row steady state for 3 minutes at 22-24, then take (3) 10 stroke pieces at 28, 30, 32. 17 strokes at FULL Pressure, 5 strokes paddle x 10 at 30 strokes a minute. For a serious burn, paddle for just 3 strokes and begin the build up to full pressure on the 4th and 5th paddle stroke! 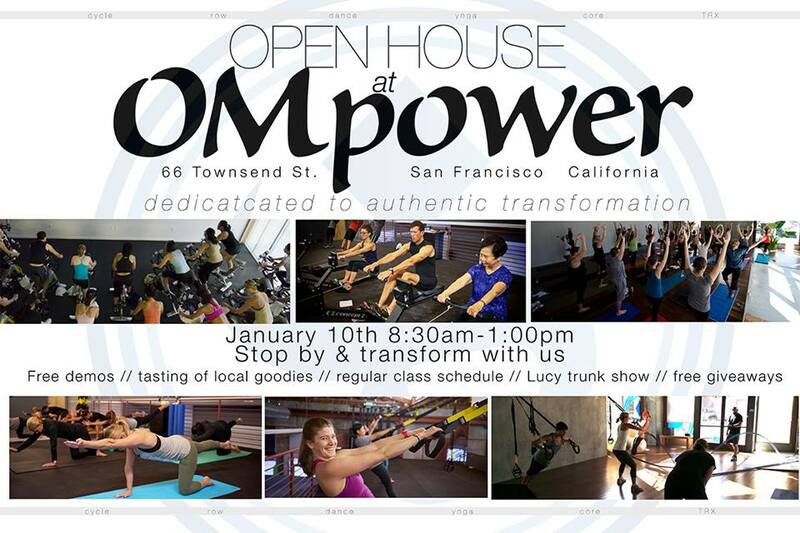 If you are in the Bay Area, you are cordially invited to OMpower on Sunday January 10, 2016 to workout, see demonstrations of the various offerings that @OmpowerSF has to offer, free treats, #Lucy Trunk Show. Workout to #Yoga, #Indoor #Rowing, #Cycling, #Running and more. Why rowing hurts – Facing fatigue and lactic acid. Rowing hard hurts. There is no way around it. If you want to go fast and get faster, you have to push through pain. In fact, the fitter you become, the more pain you can handle. But what causes this pain is not as certain as it once was thought. Lactic acid has been cast in the role of nemesis, as the necessary evil to higher athletic performance; not just in rowing, but in many sports over the years. The scientific knowledge, however, has advanced in recent decades and lactic acid seems to play a more complex role than is often assumed. Measuring lactate, however, is an indirect measure, since it is not the lactate itself that causes the acidosis (or drop in pH inside the muscles). The hydrogen ions (H+) produced with the lactate cause the drop in the muscle’s pH. Normal pH in the body is 7.2, but can drop as low as 6.6 if it were to be measured in rowers after a race, according to Stellingwerff. So, although lactate does not appear to be what is causing the ‘burn.’ it is what coaches and sports scientist tend to measure. But why measure it in the first place and how is the information useful? 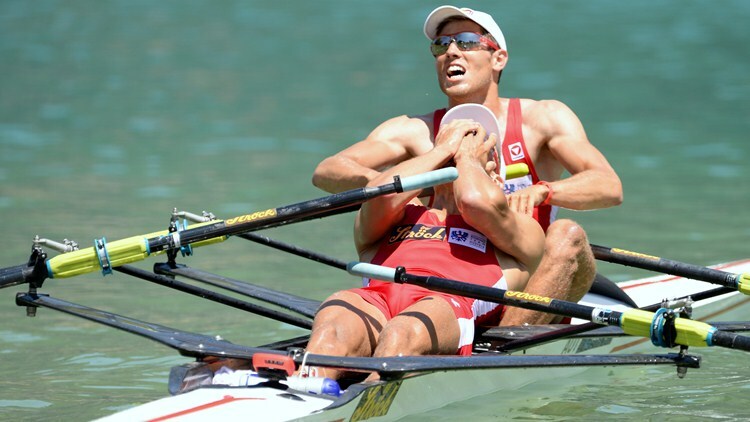 “Lactate is an important molecule to measure in the right context,” says Stellingwerff, “but it can be over-measured.” Stellingwerff knows rowing well as he worked for a number of years with the Canadian senior men’s rowing team as head of physiology. The winter session is here, and a time where huge gains are made with regard to fitness. Good time for long rows with lots of mileage. In addition to the volume it is also great to get a few shorter intense rows for the reason of building out one’s VO2 max (the ability to use oxygen efficiently). What is VO2 you ask? How does VO2max help me row fast? Training at VO2max increases the amount of oxygen your body can use. Obviously, the more oxygen you can use, the more power/faster you can row – that’s a simple one. In addition, VO2max rowing can increase the efficiency of your rowing and improve your form. Since VO2max workouts are much faster than normal training, they force you to row more efficiently and with better form. Training at VO2max also increases leg muscle strength and power, which improves economy (how much energy it takes to run at a certain speed). Below are a few good short intense workouts to make this happen. #1. 8 x 500 meters with 1′ min rest. Aim for consistency and look to be 85% of your 2K max. Rate at race pace 30-32. 100% effort. This one hurts but is over before you know it! The juice bars at gyms and exercise studios all across the country are buzzing, and the word in between sips of protein smoothie is that rowing workouts are all the rage right now. In fact, some fitness influencers are even going as far as to say that rowing is the new spinning. Did you hear that Soul Cycle? There’s a new boutique fitness trend in town and its speedy upswing isn’t at all unwarranted. From fitness fanatics to everyday exercisers, everyone loves a workout that not only offers a big burn in a short amount of time, but that’s also engaging and exciting; something that differs from the regular gym grind that consists of running on the treadmill, lifting weights or, dare I even say it, spinning. Which is why it doesn’t get much more exciting than an opportunity to invest 50 minutes in a session like the classes offered at a studio like CityRow. They alternate between cardio-based rowing and muscle-building strength training exercises for a low-impact, high intensity workout that combines the best of both workout worlds. “If you’re looking for something that’s new, different, fun and that has the ultimate balance of cardio and strength this is what you’re looking for,” CityRow founder Helaine Knapp told me. And if all that isn’t enough to convince you to add rowing to your regular workout routine, here are four more reasons to give this new fitness fad exercise that has actually been around for ages a try. “Because it’s low impact, it can just appeal to more people,” says Knapp. “Someone that’s recovering from an injury or someone who just had a baby… Even my grandma can do it.” Jenkins went on to add that rowing can be a safe workout for exercisers with injuries ranging from lower back issues and herniated discs to carpal tunnel and knee pain. “They come in, have a phenomenal and safe workout and they leave tired sweating and safely walking back home,” he said. Correct me if this isn’t true: we all want to reap the benefits of exercise and maintain our fitness but wish exercising didn’t feel like such a long and arduous chore sometimes. Or is that just me? Anyway, 50-minutes might sound like a long time for working out, but I can truthfully say that every class I took at CityRow was so much fun—and therefore went by so fast—that I was genuinely surprised when the instructor slowed down the music and took us through the cool-down; every single time. 50 minutes felt like five, but I was tired and sweaty in the best way possible after every session. If you don’t have access to a studio that offers rowing workouts just yet, try incorporating the rower at your gym (or at home if you have one) into your exercise routine by creating 40 to 50 minute workouts that alternate between 5 to 10 minutes of rowing and 5 to 10 minutes of strength exercises like lunges, squats and dumbbell bicep curls. I’ll just take this opportunity to repeat one of the best benefits of this excellent form of exercise: 85 percent of your body is activated while rowing. While you’re working out on this machine you’re using your core, your arms and a whole lot of leg too. Like Jenkins said, it’s a total body experience that can’t really compare to single-plane exercises like spinning or running. Not to mention, it combines cardio and strength training for the ultimate muscle-building calorie burn. “Most people walk out of here and are like, ‘That was amazing. I can’t wait to come back… I’m gonna be so sore!’” said Knapp. Why do we always look for the easy way out? Getting in shape and improving athletic performance takes work – you sweat, you burn, you repeat. Training methods continue to evolve but they all have a common thread, hard work. Zealots of high intensity interval training or HIIT for short, profess that short and intense bursts of exercise are all one needs to get in shape. That’s right, it’s a dream come true – work out less yet gain more – but only if you’re looking for a way to hit the bare minimum. It’s true that gains from HIIT rival those of longer workouts but only when compared to low intensity, steady state training. That’s basically the kind of intensity seen on elliptical trainers all over the country – if you can read a magazine while exercising, it shouldn’t come as any surprise that it doesn’t provide maximal benefit. High intensity interval training has gained favor as a way to get a quick efficient workout. The theory of HIIT, supported by reams of scientific articles, is that multiple, hard as you can intervals can equal the benefit of a slower (read – easier) but much longer exercise sessions. The classic session – called Tabatas after the researcher that developed the program – involves 4 minutes of alternating 20-second maximum efforts with brief 10-second rest periods. A training program built around two of those four-minute efforts was found to supply equal benefits as 40 minutes of easier exercise. Eight minutes of hard exercise versus 40 minutes – most would make that choice. But slow down – literally and figuratively – exclusively jumping on the HIIT bandwagon ignores the fact that the body uses a variety of systems to power exercise. While the systems overlap, focusing exclusively on one type of training ignores other important energy systems that are responsible for peak performance. Even the coaches and researchers that recommend HIIT specify that it shouldn’t comprise more than 20% of a training program. While HIIT training has become the workout du jour, threshold steady-state training (sustained hard effort) has been used for years by top coaches and athletes as it improves the body’s ability to eliminate lactic acid. Steady state workouts are performed at the highest intensity that one can sustain for a 20-60 minutes, i.e. race pace. Although HIIT is performed at a higher absolute intensity, it incorporates frequent breaks that allow the participant to recover. Steady state or lactate threshold training is performed at a high intensity for a much longer time, allowing the body to adapt physiologically to sustained hard efforts. To use a running example – improving your lactate threshold allows one to run a 5k at a 7:00 min/mile pace rather than a 7:30 pace. There are multiple pillars that form the foundation of athletic performance and they include – strength, cardiovascular endurance, power, and speed. While the relative balance may differ by sport or activity, all of these facets should be addressed to achieve full athletic potential. For example, a football player doesn’t need the same type of aerobic endurance that a marathoner might, but still needs the endurance necessary to sustain repeated hard efforts over the course of a game. Conversely, the marathoner doesn’t need to be able to push around 300-lb defensive linemen but needs the strength to shock absorb joints and maximize muscular endurance and efficiency. Weak muscles have to apply too much energy per stride and so quickly become fatigued and inefficient. One study of different training methods in rowers found that steady state threshold training elicited the greatest response in muscle building hormones. Sustained exercise, as compared to interval type training, increased testosterone and growth hormone levels to a greater extent. Increases in growth hormones are critical not only for improvements in fitness and performance but have been linked to improved mental function and well-being. When it comes to weight loss a recent article in the Journal of Obesity found that while HIIT may be advocated as a time-efficient strategy for eliciting comparable fitness benefits as traditional continuous exercise it appears to be less effective for weight loss. This by no means suggests that high intensity interval training is a waste of time or isn’t a valuable tool in improving fitness. The take-away points should be: exercise training should incorporate a variety of different intensities and times to provide maximum benefit; and the most important, there are no shortcuts in health and fitness. Creating power during the drive phase of the rowing stroke is very important. The amount of power can vary of course, and it isn’t predicated on how fast you row. For example, it is possible to row with 100% effort at an 18 stroke rating just as it is to row 50% at a 18 stroke rating. The only difference the rower experiences is a change in rhythm and ratio of power to rest. As rowers get more ‘efficient’ with their power to their rate, they ultimately get fitter. Theoretically, the faster pace a rower can row at lower rates, the faster and more efficient they can be when the raise the rate. Below is a practice to help with rate vs power. x 2 with 1:30 rest in between. beginning at 20 stroke rate for first minute hold your pace around 65%. On the 2nd minute, row a bit harder and knock 2-4 seconds off your previous pace, but do not raise the rate. Keep it at 20. Thrid minute pull harder and knock another 2-4 seconds off your pace and maintain 20 strokes a minute. You’ll notice the effort created gets greater and the recovery phase needs to be slower to make up for the quicker drive. This makes for better ‘ratio’ and better efficiency of power to rest. Repeat and raise the rate 2 beats and apply the same increase in effort at each minute without raising rate. Enjoy Your Row and Feel The Wheel! At one point, many endurance athletes avoided strength conditioning for fear it would be detrimental. However, studies have shown that this is definitely not the case and even heavy resistance training can aid endurance performance. Long-term strength endurance is required by athletes such as distance runners, swimmers, cyclists, triathletes and rowers for example. Sports such as soccer, field hockey and basketball also require good muscular endurance, but the intermittent nature of these sports requires short-term strength endurance. Short-term muscular endurance is required for sports and events that last between 30 seconds and 2 minutes. Certain swimming and running events fall under this duration and strength endurance is required to maintain a high level of work throughout the race. But sports that last much longer than 2 minutes like soccer, field hockey, rugby, boxing, wrestling and martial arts also demand similar short-term strength endurance. Games like these consist of short, repetitive bouts of high intensity activity, often with little rest periods in between. There are many forms of circuit training to build short-term; strength endurance. Athletes competing in continuous endurance events such as distance running or cycling require a different program design. Of course, you don’t have to be athlete to benefit from circuit training. Circuit training workouts can be used for general fitness or for cross training during the closed season. A suitable circuit training program will help athletes to cope with fatigue and tolerate high levels of lactic acid accumulation. A relatively low resistance is used and circuit stations are completed for brief periods of time similar to what might be expected during competition. Length of exercise (:30 sec or :60 sec) followed by equal or half rest (e.g. :30 sec ON, :15 OFF). Begin with equal rest and as your body and system adjust then you can lessen the rest time while keeping the work time the same. Always be sure the exercises are done methodically with good technique. Racing the clock leads to bad form and injury. Below is a sample circuit that can be done anywhere. Do this 1x through and see how you feel. As you get stronger add a set until you can do 4x through without stopping. You’ll find that you may not need any weights! !